STUNNING DETAIL in this 2 story home offering 3564 sq.ft. 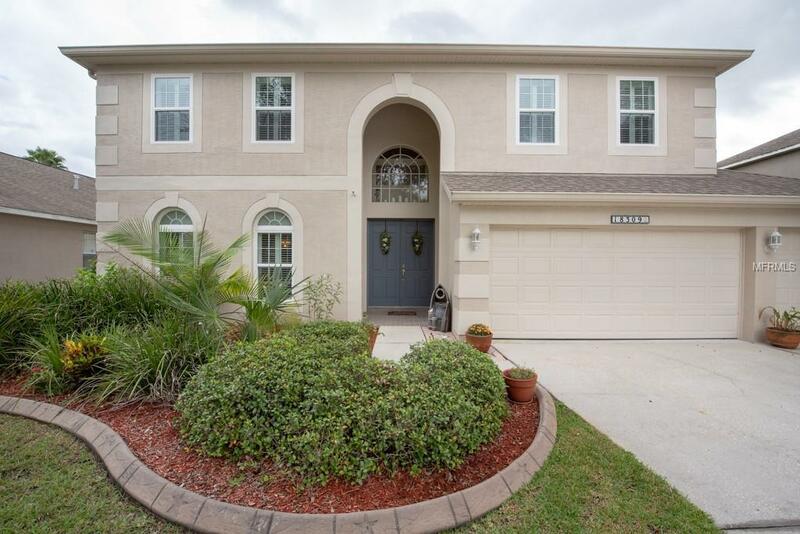 5 BR, 3 BA, bonus rm, balcony, 3 car garage w/shelving & gorgeous lanai w/heated pool encased in a 2 story screen enclosure. Located in a serene New Tampa setting on over sized lot offering epic water & wooded conservation views in sought after Danforth subdivision. This beautifully appointed open plan has high ceilings, custom staircase, plantation shutters & new weathertite thermal windows. Well designed home offers 1st floor formal living/dining rm combo & family rm w/triple sliders accessing the sparkling pool, BR 1 & BA serves as pool BA w/walk in shower, laundry rm with w/d, negotiable, & extra storage w/coat & linen closets. Epicureans will delight in large kitchen w/granite counters, 42" wood cabinets, island, gas range, granite sink, huge pantry, dinette area, built in desk & slider to pool for ease of entertaining. Upstairs you will find the huge master retreat w/sliders out to private 2nd floor balcony to enjoy your coffee while bird watching over the conservation. The en suite bath boasts walk-in shower, garden tub, dual his/her vanities, separate water closet, 2 walk-ins & linen closet. Other 4 BR's & BA's are bright & spacious. Guests will adore large bonus rm which can fit a pool table! Community amenities include pool, fitness, tennis, & parks & just minutes to 1-75, restaurants, Moffitt, Shops@Wiregrass, & top rated schools.